Apple has released a replacement for its old Remote app, rather than an update. A new remote app designed for the Apple TV addresses most of the remaining points of friction between the fourth-generation TV box and the increasingly long-in-the-tooth Remote app designed for controlling iTunes and previous models of the Apple TV. The new app effectively simulates a Siri Remote and features a game mode that sits somewhere between a Siri Remote and a physical game controller. It’s also free, as opposed to $80 for a Siri Remote made of atoms. The new Apple TV still feels unfulfilled, and that’s partly to do with it being released in what felt like an incomplete form. The new app and tvOS 10 may help take it all the way. The default Apple TV Remote app functions just like a differently shaped Siri Remote. When the fourth-generation model shipped in October 2015, the original Remote app couldn’t work with it, Bluetooth keyboards were unsupported, and Apple said third-party game controllers had to be optional for games, not mandatory. Adding to that malaise at release, the Siri Remote remains one of the least well-designed Apple products in recent memory, with no easy way to determine which end is up by feel without brushing its touch pad, which could scrub the active video or audio. Apple also changed the simulated keyboard entry in tvOS, using an absurdly wide line of letters and numbers instead of a grid. Given the number of passwords and other data that needed to be entered when setting up an Apple TV, this all combined to make the interaction side of things half baked, even when the device and tvOS were just fine. In December 2015, Apple added Remote app compatibility, and in March 2016, it fixed some of the Siri Remote touch issues and added Bluetooth keyboard support. 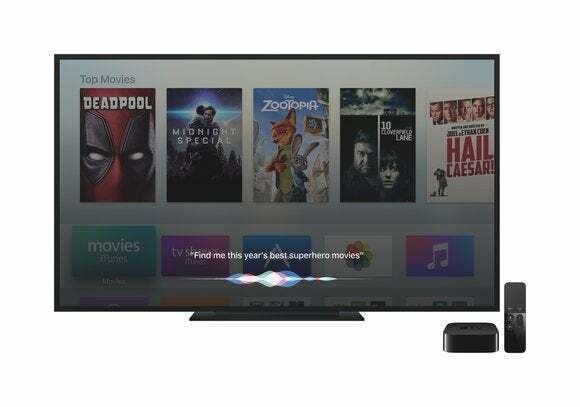 The app pairs to an Apple TV just like other remotes, requiring the entry of a code displayed on the screen connected to an Apple TV. Once paired, the screen looks like a slightly wider Siri Remote with a different arrangement of the buttons. The most significant difference between the physical remote and the app is that whenever a text field is selected on the Apple TV, a text field and keyboard appear in the app, just as in the previous Remote app. Using Siri in the app is a weird experience, because the app still requires that you hold down its virtual Siri button, and it relays your voice data to the Apple TV for processing, rather than using built-in iOS support. This is a good choice given the range of hardware on which the remote app can work, but it was confusing at first; the Apple TV does prompt you to hold down the button, just as with a Siri Remote. The Siri button doesn’t appear for older Apple TVs. For countries in which Siri Remote isn’t yet enabled for the fourth-generation model, Apple has enabled dictation mode via iOS just for text-entry fields, instead of for system-wide use. 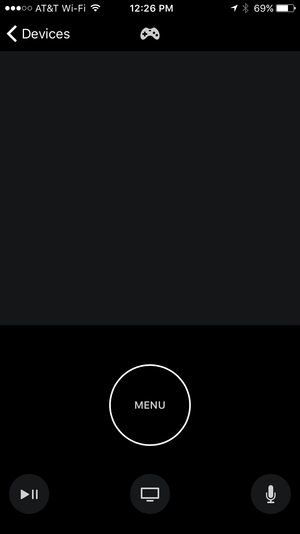 The app changes which buttons appear by context, so when you’re playing music, track forward and back buttons appear, and watching a video, 10-second rewind and advance rewinds buttons show up. The app also shows album art or a video cover. On an iPhone with 3D touch, you get force feedback when making certain choices, although I wasn’t able to find cases outside of games in which that occurred. The app also sends gyroscope and accelerometer information for movement and relative orientation, just like a Siri Remote, but I was hard pressed to find apps that supported these. I tested with several games, and only Octodad: Dadliest Catch made use of tilt. The Apple TV Remote includes a Game Mode with a reduced interface and landscape orientation. 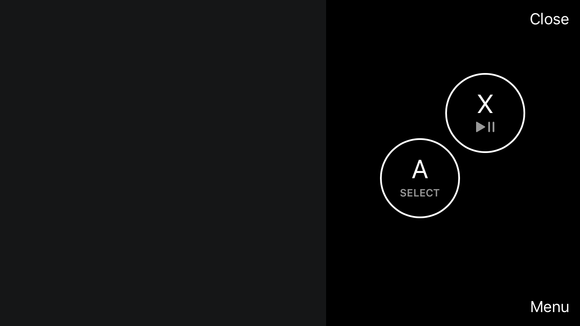 The game controller makes it easier to hold in two hands, and the Select and Play/Pause buttons double as old-school A and X buttons. In testing with many games, the apps don’t recognize Game Mode as a controller, and Apple hasn’t provided details yet on whether app developers will be able to sense that mode. With tvOS 10, Apple will allow app makers to require a game controller, and it may be that the new app will gain more capabilities then. Where the Apple TV Remote app will really make a difference is in households that don’t want to pony up the money for additional Siri Remotes, but want to use games that require multiple remotes. With an iPod touch or iPhone running iOS 9.3.3, Apple has now opened up a cheaper way for families or roommates to play games together.